When one thinks of a Greek meal, a variety of pictures may come to mind. A juicy souvlaki, a warm plate of moussakas, or a roasting lamb on a spit are perhaps the first that one would think of. Although these are very much part of the modern Greek diet, it by no means makes up the majority. In fact, the average daily diet of a Greek person will almost always consist of some sort of vegetarian food throughout the day. It can be argued that some of Greece’s most traditional and very tasty dishes are meat-free and there is a huge range of them. This makes Greece a great place for vegetarians, there are countless options! Aside from Greek food being delicious, this cuisine is considered one of the healthiest in the world. This goes all the way back to ancient times, where the ancient Greeks believed that diet goes hand in hand with healthy spirituality and philosophical serenity. As a matter of fact, vegetarianism as a practice, the idea of nonviolence to animals, has its roots in ancient Greece as well as ancient Indian civilizations. This was promoted by religion and philosophy of which ancient Greece had an abundance of! In later years when meat was more widely consumed, it was still only reserved for the very wealthy and was considered a luxury, the average Greek in antiquity would eat meat once or twice a year. The ancient Greeks would eat an abundance of fruits and vegetables - just like they do now! Another reason why it is so easy to find vegetarian and vegan-friendly meals in Greece is that the Greek population is 98% Greek Orthodox. The religious guidelines that Greeks follow, call for extended periods of religious fasting (for example, lent) where animal products are prohibited. This has meant that Greeks have learned to eat animal-free and have developed lots of nutritious and yummy alternatives to keep them going through Lent. That being said, you can be sure that anywhere you go to eat in Greece, you will find a long list of great vegetarian options that will ensure you get a great dose of traditional Greek cuisine. 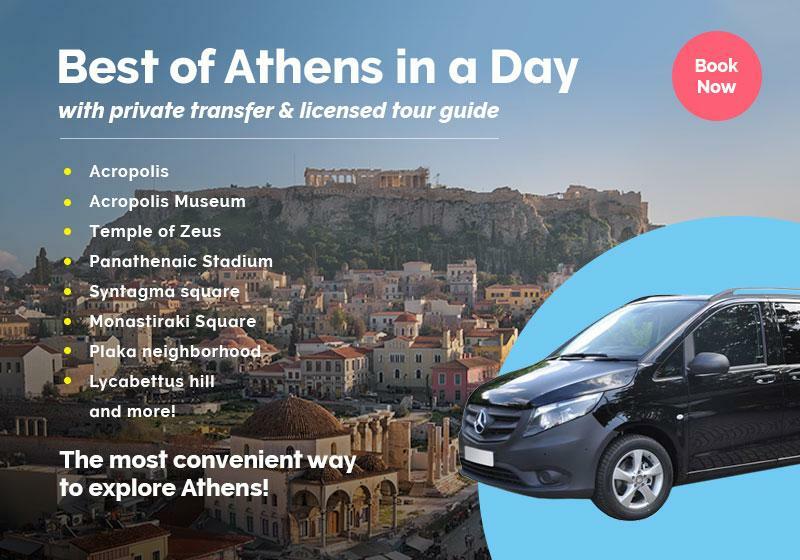 The team at Greeking.me have understood the need for exploring Greece’s meat-free cuisine and has thus developed the Vegetarian Food Tour which has proven to be a great success and very popular! This silky garlic infused Greek yogurt dip is one that you must try on your trip. This is always on a local’s table because they use it as a dip for everything! French fries, bread or even on its own - it is a healthy way to add a little texture to your meal. An alternative method of cooking one of Greece’s loveliest vegetables, making them extra crispy while preserving they juicy creamy texture inside. These are perfect for dipping in your tzatziki sauce! There is nothing like a bit of fried cheese for a starter: a very popular appetizer among Greeks and is any one of a variety of cheese that is prepared in a small frying pan. It is quite salty but there is a special variation which consists of a drizzle of honey and a sprinkle of sesame seeds over the cheese combining the sweet and salty tastes absolutely perfectly. A dish heavily influenced by the occupation of the East, dolmades are stuffed vine leaves which are filled with rice and herbs, usually marinated in lemon juice and served cold. These are so tasty that they are actually addictive - you will find yourself wanted to order seconds! Another essential dip on your Greek table is an aubergine salad dip, perfect for dipping your bread in and potent with the aromatic flavors of Greek soil. Like many Greek foods, this is a super healthy and vegan-friendly addition to your table that is usually seasoned with lots of Greek herbs to give it a kick. It may seem boring to just order a plate of greens, but don’t judge a book by its cover! The seasonal greens, or in Greek Horta are so dense in texture and flavor that it feels like a meal in itself. The slight bitterness is perfectly contrasted with lots of lemon juice that will accompany your plate - you will feel as if you are detoxing your body as these seasonal greens are no doubt a superfood! This list is just scraping the surface of all of the amazing vegetarian variations that you can find in this beautiful country. You can be sure that you will never be short of mouth-watering food options on your trip to Greece - so do come hungry and join one of our culinary Greece tours!